The main train station in Copenhagen has 3 entrances and you should look for the third one with stairs going down towards Istedgade. 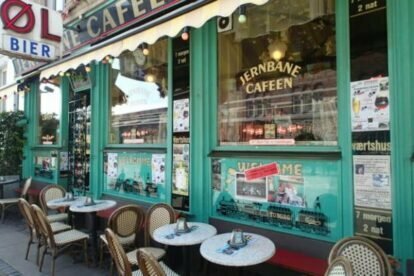 The first thing you will see is the characteristic front of Jernbane Café. The place is not only a great bodega, but also a perfect place for sitting outdoors, looking at all the busy, funny looking people walking by the train station. The room inside oozes of an old fashioned bodega and the staff is the kindest around. One of Copenhagen’s finest. Go to the bar and ask for a pilsner number 7 – which is Jernbane Café’s own brand. Have a look around the decorated walls, talk to a few friendly people and listen to their stories. They usually come from all over the country to have a drink before the next train leaves. Bonus info: the express toy train goes around the room every hour or so. Go for the beer medals: Ask for a “discount card” at the bar and get a “stamp” for every beer you buy. Before you know it, you will be able to get the bronze medal for drinking 10 beers. But the game doesn’t stop here. The winning price for drinking 17 beers is a silver medal, but if you reach number 27 and a golden medal – you will also have your photo taken at the bar, which will be exhibited in frames hanging down the ceiling. Winner takes it all (+ hangovers).